Once again, The IO staff is overwhelmed with holiday greeting cards thanking us for our commitments to truth and health in this time of sickness and deceit and wishes for a Merry Christmas and Happy New Year. To all of you who have sent us cards and letters: Thanks and we love you, too. And to everyone else, thanks for sticking with us, thanks for your stand as remnant Americans and may we all be rewarded for our efforts as we seek justice for all men, women and children. At right is a scan of one card that was sent to us. 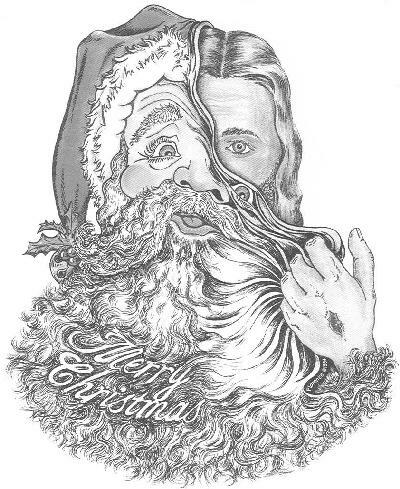 On the card was a drawing by Portland, Oregon, artist Brian Florence that captures what underlies the corporately-driven hyper commercial mask of Christmas: The birthdate of Christ. Celebrating the former is not necessarily celebrating the son of God. What is Christmas, anyway? Was it truly the birthdate of Christ or was his birthday moved so the world would be secretly celebrating some pagan winter holiday? And who is the fat guy in the red suit from the North Pole? Attempting to answer either question causes us to lose sight of the spirit of Christmas—Christ’s message to the world—and how we should celebrate Him. What does it matter "when" we celebrate Him; what’s important is that we do—as a reminder that one cannot buy what it takes to follow His example. It has become an unfortunate twist of our modern-worlder fate that our spiritual foundations must endure this annual assault by the militant forces of commercial exploitation. The good news is that, once the irreverent commercialization of the day that has been chosen for the world to celebrate the birth of Christ ceases, and it will, the teachings of Christ will remain. Until that day, expect nothing from The IO or its staff, wrapped with a bow, to be under your xmas tree. What you can expect, however, is that we will carry the spirit of Christ with us always and that we will continue working with all of you so that peace and justice will one day reign. Amen.